Last Summer - On Sale! 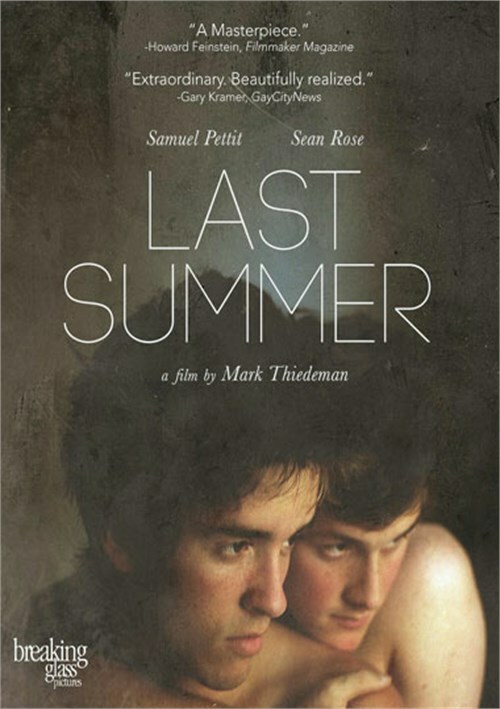 Last Summer tells the story of two high school sweethearts, Luke and Jonah, who spend their final months together over the course of a long, quiet summer in the rural South, contemplating their uncertain future and the uncertain future of America. Jonah, sensitive, quiet and artistic, prepares to leave his small town for college, leaving Luke behind, but all he wants is for Luke to ask him to stay. But Luke, an athlete struggling through summer school, knows that his boyfriend needs to experience the world beyond their home. A positively gorgeous, melancholy meditation on young love that will touch your heart. Lead actors Samuel Pettit and Sean Rose, both newcomers, are terrific. They also make a completely adorable romantic pair. Last Summer positions their love story against a world of baseball fields, bicycles, church and seemingly conservative values, though the boys never face adversity from their community; instead, in a clever and original move, director Mark Thiedeman makes sure that their relationship fits directly into the fabric of their all-American town. Movie has no plot whatsoever, every shot feels like it's a few seconds too long and there are way too many 'dramatic' shots in there for absolutely no reason -- I feel like they're there just to add seconds to the movie. This film is stunning in its melancholy beauty. This first feature from Mark Thiedman proves that he has a natural mastery of this art form. Gorgeous cinematography! Not a single unnecessary word of dialog. "Last Summer" will haunt you with a sweet sadness for days. If you have been raised on typical Hollywood movies and have never been exposed to the heights of what film can achieve as an art form, I urge you to open your mind and your soul to something new rather than dismissing it as "boring." This work is to be experienced as poetry. Turn off your analytical mind and just feel it. If you aren't willing to do that, it's your loss. Well done! My heart is aching--in a good way. This is one of the worst I have seen in a long time. Very slow, I mean really slow. Could have squeezed it all into 20 minutes. I was hoping this was going to be a great little movie - it is not. It's awful and a waste of time. I wish now that I had gone outside and watched the grass grow for 73 minutes. It was absolute to watch this movie. I kept wanting to fast forward every five minutes. Seriously, I am not exaggerating. There is virtually no dialogue between any of the actors. When we do hear the actors speak, it is off camera. There is zero character development in this movie. The bulk of this movie consists of meaningless B-roll shots of walls, nature scenes, old buildings and the two main charactersing all day. No wonder Samuel (Luke) and Sean (Jonah) wereing all through this movie, they must have been exhausted by the boredom. This movie would have worked better as a 10 to 15 minute short film, without all the meaningless shots and zero dialogue. I got the Last Summer DVD a few days ago and fell in love with the movie. It's so beautiful. I've posted online reviews praising it in all the places I know to do it. I've recommended it to a gay psychotherapist in Tennessee who specializes in gay patients, because I believe just seeing the movie's treatment of being gay, in the South especially, as perfectly normal and healthy could heal many wounds. It even healed something in me that I had no idea needed healing. Last Summer is about two teenage boys, Luke and Jonah, during the summer after their last year of high school in a small town in Arkansas. They have been best friends since they were toddlers, and they've been lovers for an unspecified amount of time - presumably since puberty made it possible (Luke says, "forever" when his teacher asks him how long the two have been together). Their families and everybody they know knows about and supports their relationship. Jonah is a gifted student, artist and musician, while Luke isn't good at anything except sports, so they complement and help each other. They will be parting for the first time in their lives at the end of the summer, when Jonah goes north for college and Luke stays. This is a blissful, idyllic fantasy that feels completely true. If I didn't know that boys like these would NEVER receive such support in such a town, I would believe it was a true story, even a documentary. Although rationally I know it's impossible, it's so real and true emotionally that what ends up being impossible is NOT believing in it. Nothing much happens in this movie. There's some voice-over narration and some dialog, but it's primarily a sensual movie, a series of exquisitely beautiful visual and aural images that are impossible to describe adequately. Images of nature, of the boys in extreme closeup, many abstract images that are unidentifiable but powerfully evocative of the quiet, sensual, languid world in which the boys live. The score - when there is a score - is lyrical piano music by Beethoven and Schumann. Last Summer is like a poem - about love, about beauty, about peace, about perfect harmony with the natural world. It's extraordinary and indescribable. I never recommend that straight people watch gay movies, because if a gay movie is acceptable to straights it's by definition a failure. But this movie is so beautiful that I'm breaking that rule. Whoever you are, your life will be enriched if you see it. This long, boring amateur movie defies description. I tried to fast forward through the long endless and mindless scenes of insects, leaves, skies, anything you could think of to extend this mess. The lead (actors) are in about 5% of the movie and do not portray one bit of real humanity or affection. As I sat and watched "Last Summer" I felt like I had seen it before and that was because of two reasons-the first is that it was filmed in a state that I called home for seven years-Arkansas and secondly because I was reminded of the lyric beauty of Terrence Malick's films about England. Luke (Samuel Pettit) and Jonah (Sean Rose) live in small town Arkansas and they have together like glue since they were both four years old. There is a love between the two that is beautiful to see and it bothered no one. However, this is their last summer together. Jonah is going off to college in the fall and leaving Luke behind. In that last summer they seem to lose themselves in each other while they still are able to do so. Director Mark Thiedman gives us his first feature film which combines youthful passion with the beauty of nature. The cinematography by David Goodman is gorgeous and more than makes up for what the film lacks in plot. When I first watched this film, I felt it was just a big bore which might have been caused by my watching several other films the same day. Re-watching I realized I had missed a beautiful film. It demands patience but that is rewarded with this beautiful look at young love. The idea for the film is far from new in the world of film both in gay and non-gay movies. That last summer is a rite of passage-we have all been there. There is something about this film that is very different from others I have seen. It is like watching a love poem being filmed or a symphonic rendering of a love story between two young men. It is also a look at life in small town which is usually seen as a place of danger for gay people. One review that I recently read said that the entire plot can be summed up with one sentence, "two teenage boys are contemplating the end of their romance". As Jonah prepares for college, Luke tries to understand what life will be like without him. This gives the director a chance to concentrate on the rural beauty of Arkansas and there is beauty there (just not much else). I suppose I found the movie to be a surprise having lived in Arkansas as an openly gay male. I found no acceptance, no tolerance and no attempt at understanding. Gay men are constantly arrested in public parks and the little bit of gay life in Little Rock is in the hands of three people. There is little dialogue here and I suppose that I because Thiedman had no desire for exposition. Instead he concentrates on the sensuality of the boys together. We see Jonah preparing to venture out of his home while Luke stays behind. We have to see what the result of this is. I think the most surprising thing about the film is that the homosexuality of the boys bothers no one. This is a utopian vision of Arkansas and I cannot imagine two teenage boys living and loving in a place like Mena and no one batting an eye. Arkansas is still the home of the imperial wizard of the Ku Klux Klan and I met some of the most bigoted people I have ever known there. (But then I am also Jewish). Luke realizes that their town is too limited for Jonah and he also knows that their romance is coming to an end. Their love for each other might continue but we are led to believe that they will no longer be together. This lets us consider the larger issue of whether love can last when one outgrows the territory. Jonah has ambitions and will go far while Luke has no idea of his aspirations in life. We see them as they love, as they change and as they mature. I found the film lulled me into liking it through the detailed camera work and beautiful musical score.